Redmond Mc Donnell, Financial Director; Paul Collins, Managing Director and Madeleine Collins, Quality Manager, DesignPro Automation. It’s been quite a month for us on the awards circuit here in DesignPro. 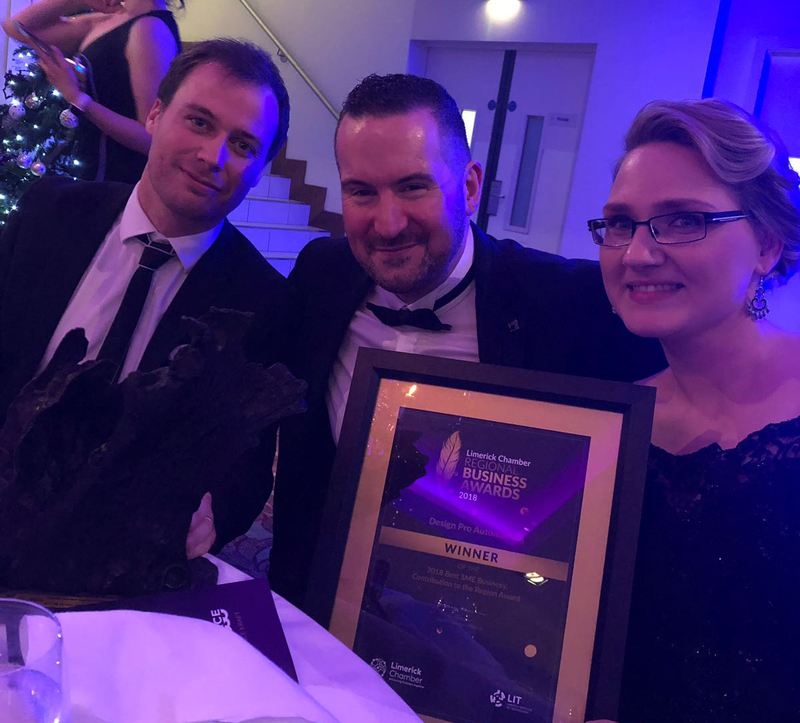 On the 2nd November the company took home an overall National Award for our Innovative Designs at the Deloitte Fast 50 awards and on Friday 16th November we scooped the ‘Best SME: Contribution to the Region 2018’ award at the Limerick Chamber Regional Business Awards. The Limerick Chamber Awards, now in its 8th year, is held annually by Limerick Chamber, with Limerick Institute of Technology as partners. The awards are designed to acknowledge companies in the local region for their innovation and commitment. Over the years it has showcased some of the region’s finest businesses and entrepreneurs. This is our second time in fours years winning the overall award for Best SME, first in 2015 and now in 2018. Speaking at the Limerick Chamber new chief executive Dee Ryan praised the standard of entries received this year. The annual Limerick Chamber Awards is sponsored by LIT and took place on Friday 16th December at The Limerick Strand Hotel. It was attended by over 400 of the region’s top business leaders and local representatives. You can see a full list of all the winners on the night here.